Due to the security changes made in MS16-072, we updated Step 4: Optionally create a GPO for Roaming User Profiles of this topic so that Windows can properly apply the Roaming User Profiles policy (and not revert to local policies on affected PCs). When moving your environment to a version of Windows that uses a different profile version (such as from Windows 10 to Windows 10, version 1607 - see Appendix B: Profile version reference information for a list), users receive a new, empty roaming user profile. You can minimize the impact of getting a new profile by using Folder Redirection to redirect common folders. There isn't a supported method of migrating roaming user profiles from one profile version to another. If you want to include computer accounts in the security group, click Object Types, select the Computers check box and then click OK. Type the names of the users, groups, and/or computers to which you want to deploy Roaming User Profiles, click OK, and then click OK again. If you do not already have a separate file share for roaming user profiles (independent from any shares for redirected folders to prevent inadvertent caching of the roaming profile folder), use the following procedure to create a file share on a server running Windows Server 2012. On the Select Profile page, click SMB Share – Quick. If you have File Server Resource Manager installed and are using folder management properties, instead click SMB Share - Advanced. Set the permissions as described Table 1 and shown in Figure 1, removing permissions for unlisted groups and accounts, and adding special permissions to the Roaming User Profiles Users and Computers group that you created in Step 1. Right-click the domain or OU in which you want to setup Roaming User Profiles and then click Create a GPO in this domain, and Link it here. In the New GPO dialog box, type a name for the GPO (for example, Roaming User Profile Settings), and then click OK. In the Select User, Computer, or Group dialog box, type the name of the security group you created in Step 1 (for example, Roaming User Profiles Users and Computers), and then click OK.
Click the Delegation tab, click Add, type Authenticated Users, click OK, and then click OK again to accept the default Read permissions. Due to the security changes made in MS16-072, you now must give the Authenticated Users group delegated Read permissions to the GPO - otherwise the GPO won't get applied to users, or if it's already applied, the GPO is removed, redirecting user profiles back to the local PC. For more info, see Deploying Group Policy Security Update MS16-072. Select all users to which you want to assign a roaming user profile, right-click the users and then click Properties. By default, deployment of all Windows® Runtime-based (Windows Store) apps is allowed when using Roaming User Profiles. However, when using a special profile, apps are not deployed by default. 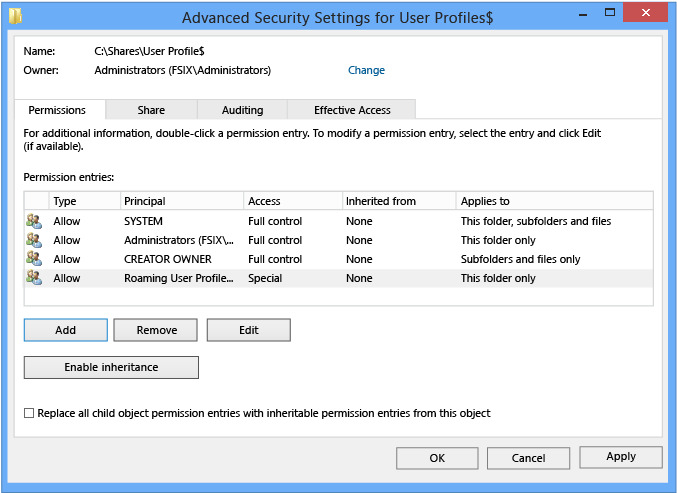 Special profiles are user profiles where changes are discarded after the user signs out: To remove restrictions on app deployment for special profiles, enable the Allow deployment operations in special profiles policy setting (located in Computer Configuration\Policies\Administrative Templates\Windows Components\App Package Deployment). However, deployed apps in this scenario will leave some data stored on the computer, which could accumulate, for example, if there are hundreds of users of a single computer. To cleanup apps, locate or develop a tool that uses the CleanupPackageForUserAsync API to cleanup app packages for users who no longer have a profile on the computer. For additional background information about Windows Store apps, see Manage Client Access to the Windows Store. You can use Group Policy to apply Roaming User Profiles to computers running Windows 8.1, Windows 8, Windows 7, Windows Vista, Windows Server 2012 R2, Windows Server 2012, Windows Server 2008 R2, or Windows Server 2008. In Group Policy Management, right-click the GPO you created in Step 3 (for example, Roaming User Profiles Settings), and then click Edit. Right-click Set roaming profile path for all users logging onto this computer and then click Edit. A user's home folder, if configured, is the default folder used by some programs such as Windows PowerShell. You can configure an alternative local or network location on a per-user basis by using the Home folder section of the user account properties in AD DS. To configure the home folder location for all users of a computer running Windows 8.1, Windows 8, Windows Server 2012 R2, or Windows Server 2012 in a virtual desktop environment, enable the Set user home folder policy setting, and then specify the file share and drive letter to map (or specify a local folder). Do not use environment variables or ellipses. The user’s alias is appended to the end of the path specified during user sign on. Right-click the GPO that you created and then click Link Enabled. A checkbox appears next to the menu item. To confirm that the user profile is roaming, open Control Panel, click System and Security, click System, click Advanced System Settings, click Settings in the User Profiles section and then look for Roaming in the Type column. April 13th, 2017 Added profile information for Windows 10, version 1703, and clarified how roaming profile versions work when upgrading operating systems - see Considerations when using Roaming User Profiles on multiple versions of Windows. Customer feedback. March 14th, 2017 Added optional step for specifying a mandatory Start layout for Windows 10 PCs. Feature changes in latest Windows update.